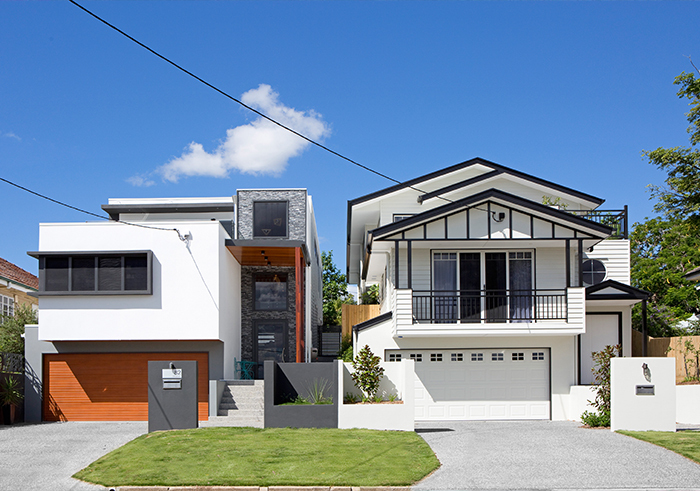 High on a ridge in Tarragindi, two new houses sit side by side, taking in glorious views. 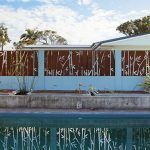 In a trend familiar to residents of Brisbane’s inner suburbs, an 800m2 block has been subdivided enabling two families to enjoy all the amenities and advantages of living in an established area. 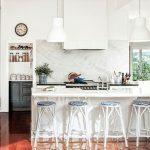 It’s nothing new for Nick O’Shea of O’Shea and Sons Builders to take on a project like this, and his expertise and experience show through in the fine detail of the two houses. 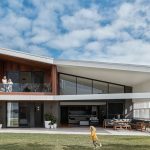 Although they are built with a similar footprint, each home asserts its own character and identity while at the same time managing to fit into the profile of the surrounding homes. Designed by Jamin Design Group, one house is unapologetically modern while the other is unmistakably Hamptons, one is home to a boisterous and expanding family and the other to a professional couple; and in a tribute to good design, both are perfect living spaces for their respective owners. 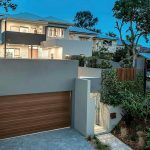 The contemporary home features, on the ground floor alone, generously proportioned outdoor areas, kitchen, living and dining spaces, a laundry, guest bedroom and ensuite, a media room and gallery that houses the family’s artworks. 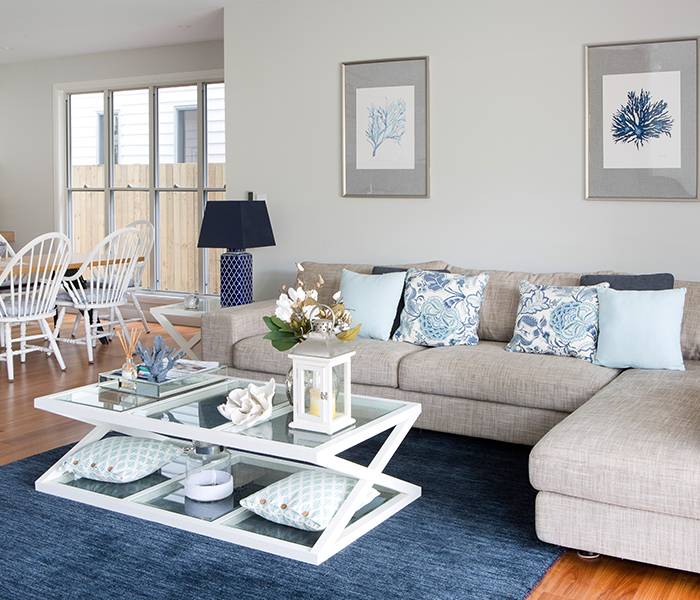 Upstairs is home to four bedrooms, the master with ensuite, a bathroom, study/office and deck where the view is the star. 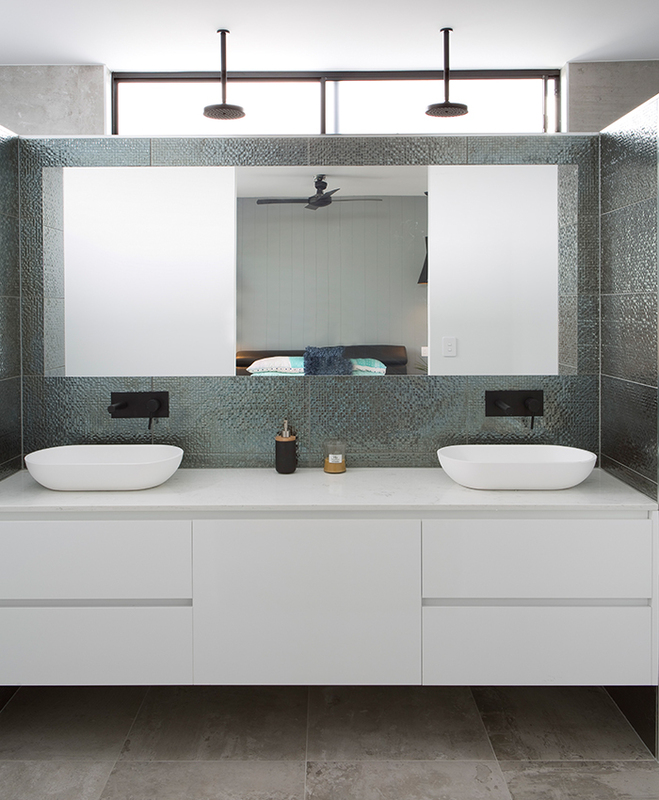 The ensuite is a sanctuary in its own right, with blinging silvery grey tiles to offset the chic matte black tapware sourced from Harry Harry Home – it’s gorgeous, elegant and sustainable. 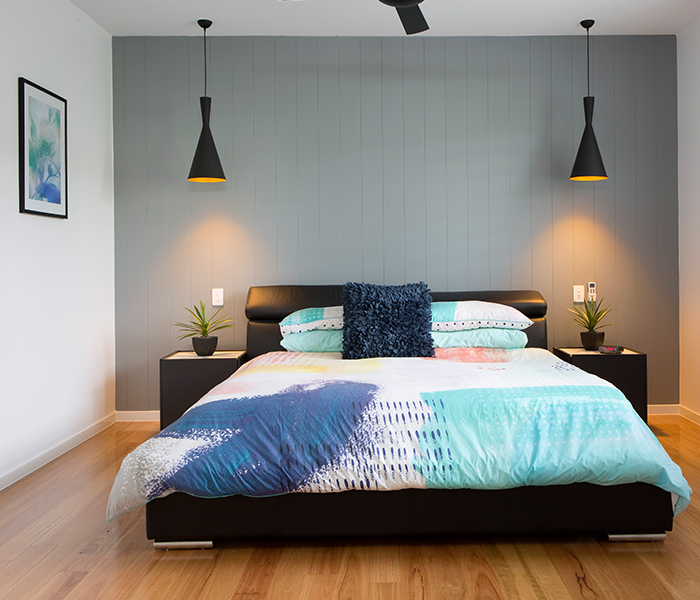 Maree O’Shea, the in-house interior designer for O’Shea and Sons Builders, has used a palette of white, black and timber to develop a sharp, crisp look for the contemporary house while allowing the flowing spaces to imbue the home with a sense of harmony – very important for a busy family. 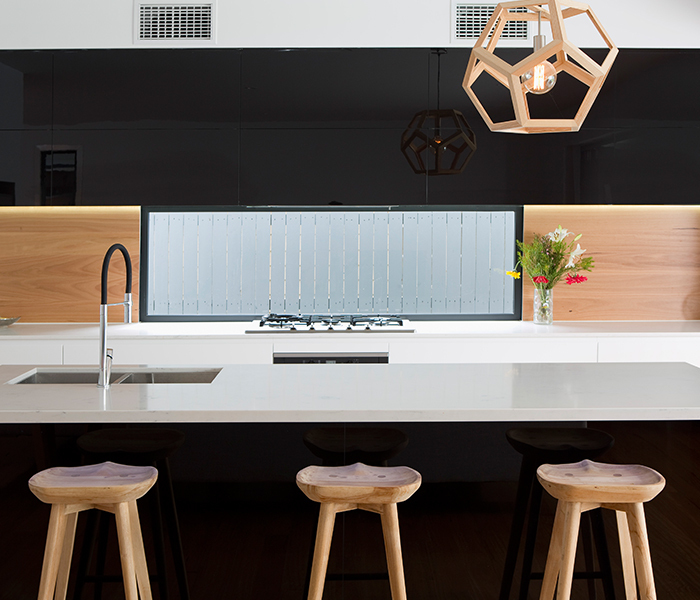 Blackbutt timber floors are reiterated in the kitchen splashback, providing a counterpoint to the Polytec Ultra Glaze overheads and the 2pac handleless base cabinets.The cabinetry throughout the entire house is a key feature. Allfit Cabinet Solutions advised that the fitting systems supplied by Lincoln Sentry ensure these cabinets don’t just look sensational but work efficiently and effectively for years. 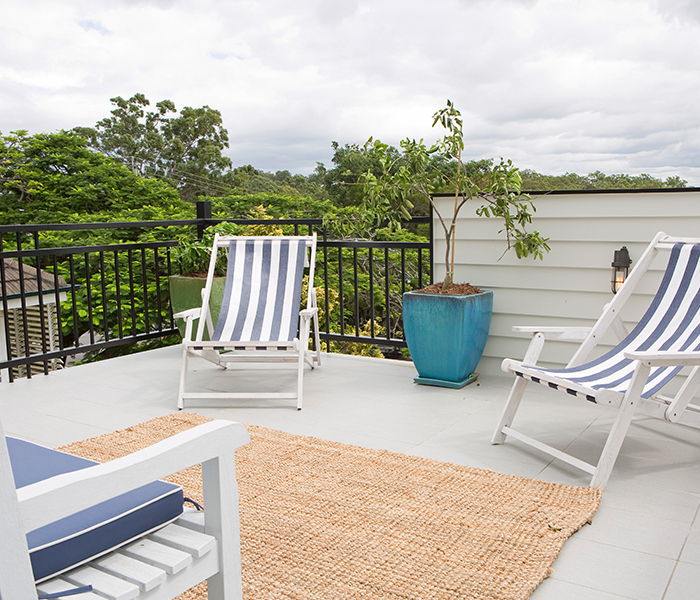 Next door, things couldn’t be more different – the more traditional look of the popular Hamptons style is evidenced in the James Hardie Scyon Linea weatherboard which works perfectly with the fine detail of the black and white gables and balconies at the front of the house. Inside, the whole effect is softer and is enhanced by the kitchen which is a centrepiece of the open-plan living/dining area. 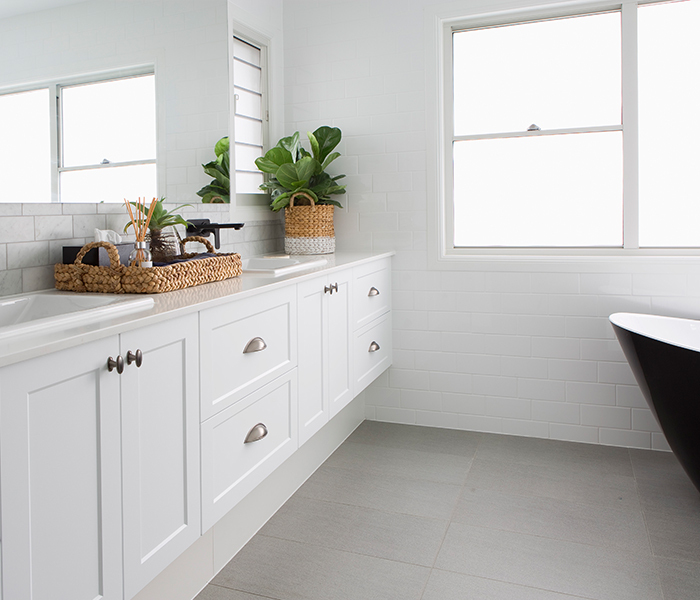 With its finely detailed profiles, it sets the scene for the Hamptons look which the owners wanted. 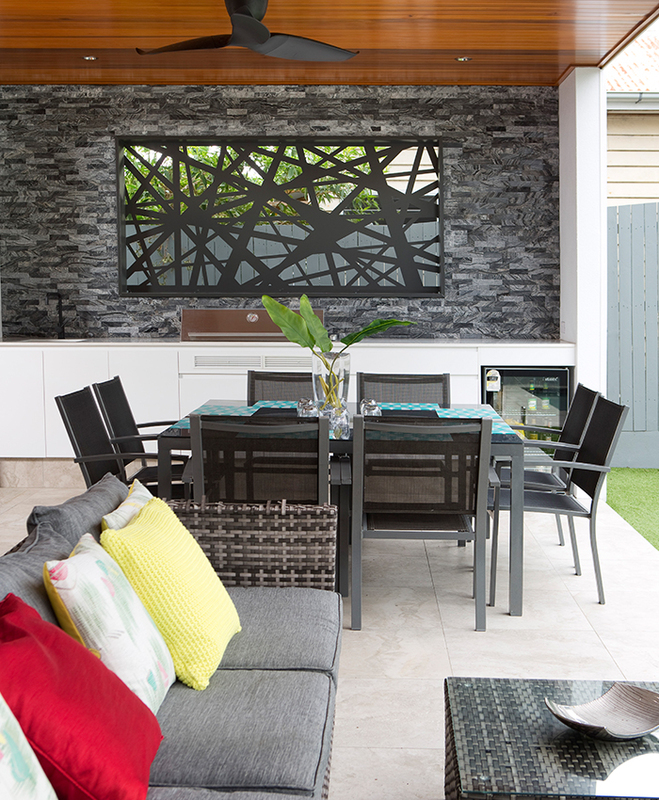 This kitchen doesn’t just look good though – check out that double oven and the cooktop above it – there are serious, hardworking appliances and like all the electrical goods in both homes, come from Harvey Norman Aspley. 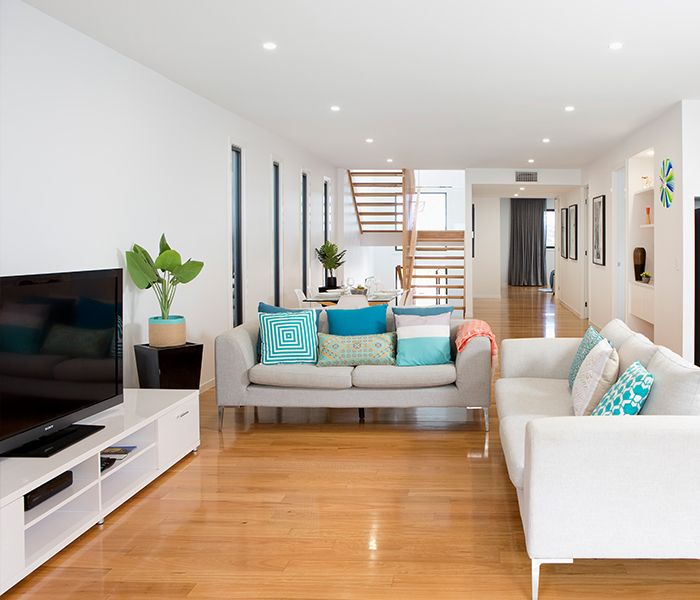 It’s a generously proportioned home with flowing spaces that integrate indoors and out seamlessly to provide the easy living that is typical of the Queensland lifestyle. 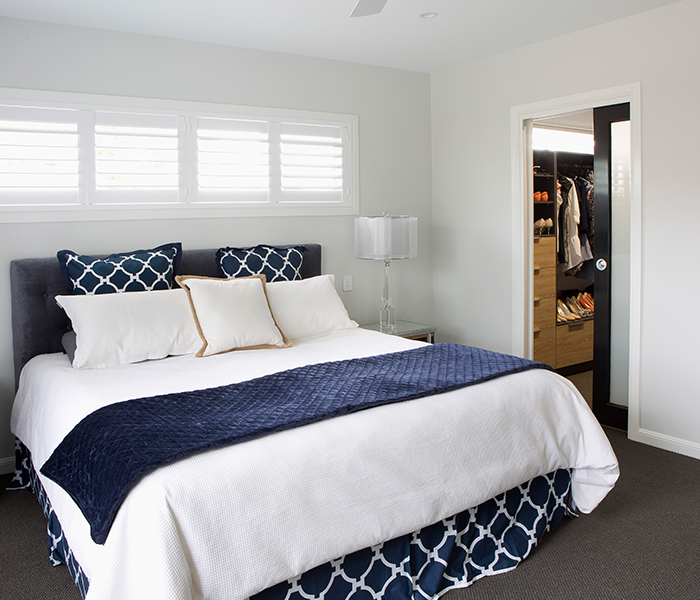 Upstairs the main bedroom, dressing room, and ensuite constitute a luxurious haven for the owners with carpets from Solomons Flooring Capalaba to sink your feet into. 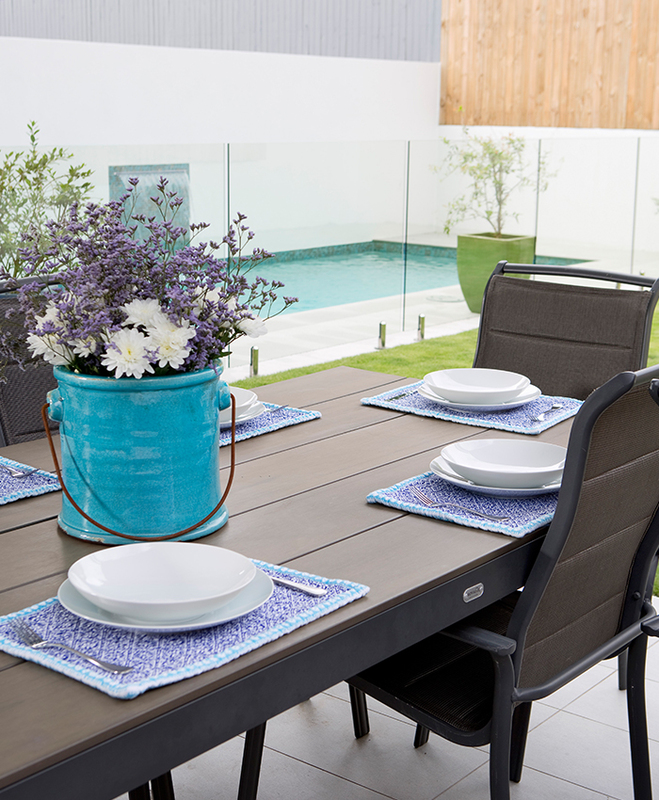 But as in the contemporary home, it’s the spacious deck at the front which plays a starring role in this home. It captures not just the views, but the freedom of space which living high offers those lucky enough to enjoy it. 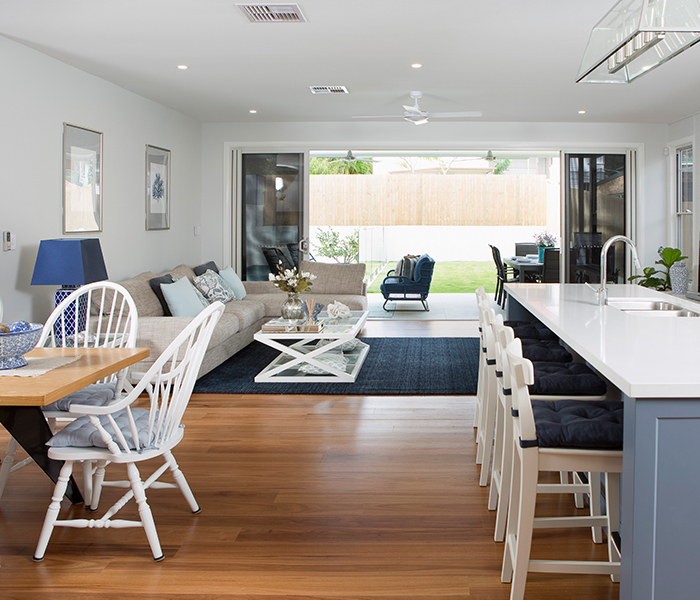 “There are so many aspects to the success of these homes,” says Nick O’Shea of O’Shea and Sons Builders, who prides strong industry partnerships in all of the projects they undertake. Two worthy mentions go to Mitre10 Mega Beenleigh for their great customer service in the supply of internal fit out materials and to Boral for their continued supply of high quality and affordable concrete products, evidenced in the driveways, footpaths, and steps.